Although I wrote everything I know about squirrel issues for this website, oftentimes a problem with squirrels in the attic is beyond the scope of the do-it-yourself homeowner to solve. I have found a professional company in Springfield, Missouri that handles problems with wildlife. S.W. 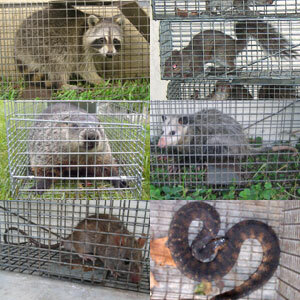 Nuisance Wildlife has access to tools, techniques, and experience that help them do a far better job at wildlife removal than a non-experienced homeowner could. They possess licensing that allows them to do certain types of work legally, that non-licensed homeowners in the state of Missouri are not allowed to do. For the welfare of your situation, and the squirrels, in some cases it's best to hire a pro. There are good companies and bad companies out there. I've done research on such companies, to get to know them, and feel confident recommending their services. I therefore recommend a company called S.W. Nuisance Wildlife which services Springfield, Missouri. If you have a squirrel problem, or any other conflict with a wild animal, and live in Springfield, I am confident that this company, S.W. Nuisance Wildlife, is the one to call. I asked the company to describe their service range, and they said this - We service the greater Springfield MO area, including Greene County, Christian County, Webster County, Dalla Countys, Polk County, Dade County, Cedar County, Lawrence County, Stone County, and Taney county. S.W. Nuisance Wildlife operates 24/7, so don't hesitate to call at any time to discuss your wildlife problem, and schedule an appointment for same-day or next-day service. i believe i have squirrels in my attick it happens every winter but mostly during the day but this year its constant all day and most threw the night. i hear scartching constantly and can hear them running we have those woden gabele vents on the front back and on each side of the house. one of them has fell down threw the attic last year and busted the pannaling on my wall and i was up at 5 am hammering it back in. i have heard moth balls will run them out and what you have suggested on your site. if you have any other information that will help please email me back and let me know im begging you because this is very annoying and nerve racking. If you have a squirrel problem in Greene County Missouri, or any other conflict with a wild animal, I am confident that we can solve it. We use humane methods when dealing with Springfield wildlife removal situations. Squirrel Control Springfield. Our company is fully licensed and insured in Missouri. Call us any time at 417-818-1412 for a price quote and to schedule a same-day or next-day appointment to solve your squirrel problem in Springfield.